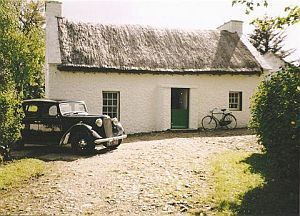 Ardroe is one of the very few traditional thatched Irish cottages in Donegal dating back to the early 17th century to have survived the passage of time. The cottage has been the home of the McElwee family since 1665 (recorded in the Hearth Tithe Role). It was built by Donal a stonemason who came from Scotland to work on the building of the privately owned historic Prehen House in Derry which has been inhabited since 1640. The cottage roof is thatched with home grown flax and the rafters and beams in the roof are made from bog oak which had been preserved for centuries in the peat bog. The family home traditionally was passed on to the eldest son and Ardroe cottage was inherited by current owner Michael, the only son of seven children. Many of the skills required to maintain a thatched cottage would have been passed on from father to son, the most important being the labour intensive method of harvesting the flax to thatch the roof. In 1984 An Taisce (The Irish National Trust) adopted the cottage as a model of craftsmanship in restoration and preservation of detail of houses built in 17th century Ireland. They said that specialised work of the stonemason, flax thatcher, blacksmith, traditional carpenter, cooper, turner, and tinsmith all give the cottage a uniquely authentic feel. When An Taisce was overseeing the restoration of a thatched cottage in Donegal the architect Anton McGowan spent several hours at Ardroe cottage noting the original details. Mr McGowan said the beauty of the house would be difficult to emulate with its richness of restored architecture in a true traditional way. 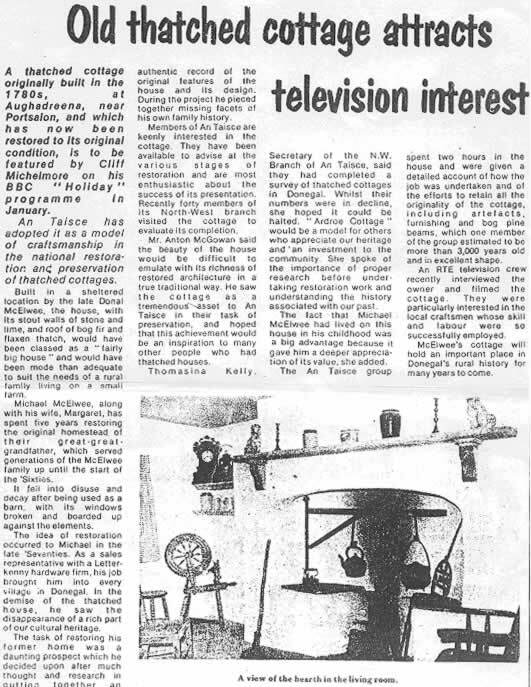 In the early 1980's the restoration of thatched Irish cottages was rare and the national television channel RTE1 gave Ardroe a slot on their evening news. In 1985 the cottage was featured by Cliff Michelmore on his BBC "Holiday" programme. In 2006 a series of documentaries called "Ceart agus Coir" were made for television channel TG4 and Ardroe cottage was used as the location for the fourth in the series. However the cottage, contents and outhouses are not museum pieces as they continue to be enjoyed today just as they were in the 17th century. The homely atmosphere of a lived in cottage still persists in this picturesque restored thatched cottage with its traditional Irish cottage garden. Ardroe cottage offers the visitor the opportunity to experience a genuine Irish heritage cottage and to appreciate such unique features as limestone surfaces, bog oak beams, thick stone walls, open hearth fireplace with crane, small sash windows and lint thatch overhanging the white-washed walls. Now owned by Michael McElwee, who lovingly restored this delightful Irish cottage twenty years ago, Ardroe cottage was originally built by his great great grandfather in the 1700’s and offers all the fine qualities we have grown to love about a traditional cottage. Guests staying at the cottage will find an ‘olde’ world atmosphere greeting them at the door, and a combination of the beauty and tranquillity which emulates from the cottage and its grounds, and the absence of any TV or radio, guests could be forgiven for thinking they had stepped back in time to a far more peaceful, less complicated time. With two bedrooms that can sleep up to four this beautiful cottage offers the perfect retreat to re-charge your batteries and get away from today’s hectic society, providing a wonderful home from home during your stay. Despite its complete refurbishment the cottage has retained all of its original character and boasts a stone floor, open fires, coved ceilings and an arched doorway but now with a fully fitted kitchen and shower room, all with hot running water. The bedrooms are decorated to an equally high standard and fit in seamlessly with the cottage’s ambiance. For those wishing to venture out of the cottage and sheltered garden the surrounding area boasts some of Ireland’s most spectacular scenery.